These items were pulled from 7-Eleven stores in Taiwan after complaints about their resemblance to Adolf Hitler. In Taiwan, 7-Eleven stores have pulled products featuring a cartoon vampire that bears a striking resemblance to Adolf Hitler after receiving complaints from the Israel Economic and Cultural Office in Taipei (ISECO) for selling the items, according to several media reports. The convenience store chain, whose 4,400 Taiwanese locations are owned by the President Chain Store Corp., has suspended sales of the key chains, USB drives and magnets sporting the apparent caricature of the Nazi dictator. Company officials originally denied that the cartoon was meant to depict Hitler, first calling the black square on the figure’s face a tooth, then a nose, rather than a mustache. But on Wednesday, the company acknowledged that many saw the image as offensive and said that it did not intend to be insensitive by selling the items. “Because there are people with doubts, we've stopped selling the products for now,” a representative from 7-Eleven told the German Press Agency, according to an Israeli newspaper. The ISECO, which is Israel’s de facto embassy to Taiwan, since China does not allow its diplomatic allies to have official ties with the island, says that while it does not think the products were meant to be a show of support for anti-Semitic ideology, the cartoon figure does signify a lack of understanding of the Nazi party’s history. Taiwan has a history of Nazi imagery popping up in public as a result of commercial use. In 1999, a local company used an image of Hitler to advertise space heaters made in Germany. Additionally, in 2000, a restaurant in Taipei called The Jail displayed images of Nazi concentration camps, while a bar in Taipei operated under the name “Nazi Bar” during the 1990s. Both businesses later removed the references. The nation’s fascination with Nazi lore could stem from the fact that the party has become a symbol of courage because of poor education, which explains why an association created to explore Hitler’s achievements was able to garner interest from 1,000 people in 2005. 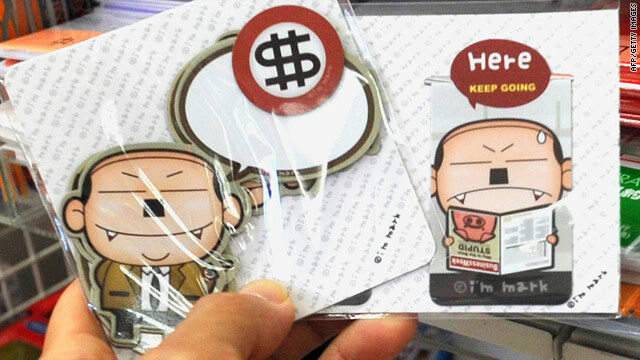 Products featuring the cartoon figure, which was designed by blogger Mark Lee, are sold in other Taiwanese stores as well, according to 7-Eleven. Lee says that while the figure’s appearance was inspired by Hitler, the cartoon was not meant to endorse any of Hitler’s views. In addition to depicting the dictator’s famous mustache, the caricature also wears a red armband and, in one version, has its arm raised in the fashion of the iconic Nazi salute. Representatives for 7-Eleven declined to disclose how many of Lee’s products were purchased during their short run on the store’s shelves. The items went on sale Sunday and sold for $15 each, according to the San Diego Jewish World. FU to Israel for telling Taiwan what is PC in a culture that had never ever had any contact whatsoever with the sordid history between the Nazis and the Jews. Should Taiwan demand Israeli society conform to what is PC in Taiwanese culture? Israel doesn't even recognize the existence of Taiwan. FU! Annie C and John and CW Cheng and Lucy and all my good friends in Taiwan: I have lived here for over 40 years and I love Taiwan, although I come from the West. But you need to know that it was NOT ONLy the Israeli embassy that voiced concern about the Hitler image on the 711 USB doll, if you read the first AFP news article, Mr Yeh the AFP reporter in Taipei also spoke with the German embassy in Taipei and an official there ALSO said the image was not very good to show in Taiwan in 2011. So don't just mention the Israeli lady who said the image was not pretty or cute to her, the German offiicial said the same thing and he is not Jewish. You are all haters out there. Stop hating. Start practicing LOVE THY NEIGHBOR. understand? and God bless Mark lee even though there is no God. God is not outside us, God is inside us all, and God's name is LOVE. But who knows what LOVE is anymore? shame on all you here who are so quick to judge and point the finger. and shame on KMT and DPP for not getting along better. Taiwan is one nation, one people, learn to get along, brothers and sisters. David, I scan through the comments, and I do not hate you. But some of the language you were using are quite strong and impolite to the Taiwanese people. Ok, it took few days for 7-11 to recall, someone out there spend a lot of effort I believe, but Taiwan is not considered as a country in U.N., so it's normal, our government don't really have any obligation to take care of this, personally, I would negotiate F-16 C/D sales in exchange of the recall. Speaking of education, I remember studied about it in high school as well as in college. We know it but we don't feel it, sorry about that. But your comment about KMT and DPP shows you do not know too much about Taiwan history although you live there for 40 yrs. The KMT ppl once did things to the Taiwanese ppl not too different from the Nazis, so, your prob don't know it or you don't feel it either, I wouldn't blame you for that. Last thing, I couldn't believe business owner were forced to have their sign changed, have the product recalled because of Nazi resemblance. I'm a Seinfeld fan, and I found the "Soup Nazi" episode very entertaining, I really wonder has anyone ever made a complaint to the production company? Cali, I apologize if i was not clear in my earlier post. I agree that KMT was like facist nazis in Taiwan history, yes. CKS was a bad guy. And you say you know the history of Hitler and the Nazis and the Jews in Europe and you know it but you don't FEEL it,.....that is the problem with Taiwan. You do not learn empathy, you do not learn how to FEEL for anything outside your own comforrt zone. I love Taiwan, you are good people, the best little country in the world, IMHO, but you guys do not learn to have or show EMPATHY from education or parents. Why can;t you FEEL the pain of other people who live far away, be they blacks in Africa or Jews in Nazi concentration camps? Something is terribly wrong with Taiwan education system and maybe religion too if you lack EMPATHY for other people who are not Taiwanese or Chinese. Can you explain this. I think the world wants to know what' s wrong with Taiwan people that they cannot FEEL the pain of other people. that is what this entire 711 Hitler doll thing is all about. But that said, I love Taiwan, Cali, please don't get me wrong. you guys rock. Just work on the empathy thing, okay? Hitler did not have thin eyes and he was not, by far, the only person to have that type of lip hair. Then today in India, some very uneducated man named his store Hitler and even added a swaztika. And this guys claims ignorance. Right. Look to your West as there is another real-life Hitler as president of Iran who wants to eliminate all of the Jews in Israel. Thank God that I now know ignorant people are actually a worldwide phenomenon. Seriously, if you have no idea about what this toy is, please don't overgeneralize every piece of tiny matter. That'd only make you look as stupid as can be.